These women are people, not simply refugees. These women could be our mothers, our sisters and cousins; they could be the next great researcher or astronauts. But if we as a civilization fail to provide them with an education, we as a civilization have failed. 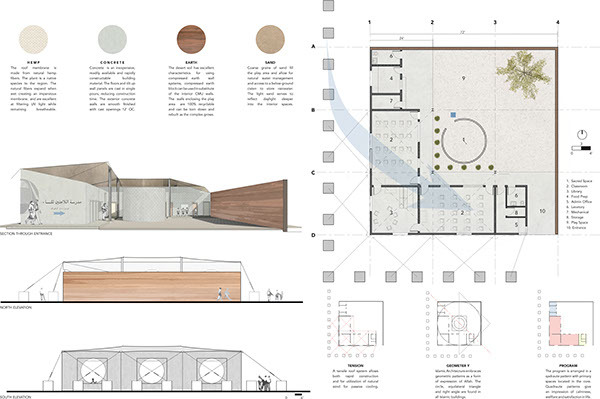 The architecture aims to provide a place of recovery and reflection for the women of Syria. It is the line, the circle and the square humbly reduced to their simplest forms. Raw in its finishes, secure in its bones; it is a place of refuge for these women and all those who enter. The building is made from earth, concrete and native plants in order to be rooted from place although it is itself temporary in nature. Tilt up concrete walls allow for reduced construction time and do not require any off site fabrication. The interior walls are concrete masonry units which can be substituted for compressed stabalized earth block if concrete is unavailable. The play area is enclosed by compressed earth walls from local soil, utilizing some of the waste from the refugee settlement. Large openings and building orientation facilitate natural ventilation with prevailing summer winds. 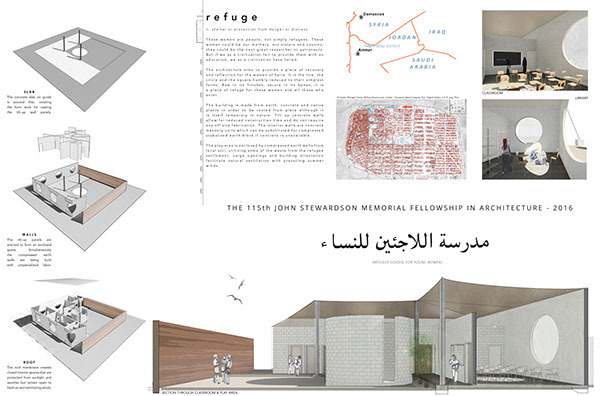 The 115th John Stewardson Memorial Fellowship in Architecture was a 10 day sprint competition to design a refugee school for the displaced women of Syria. This approach focuses on translating the characteristics of Islamic architecture and faith into a realistic and pragmatic solution to help these women recover from the tragedy of war.